The Vegan Magpie: Vegan Easter Ideas! Hello! Easter is less than a month away now and I'm seeing a lot of questions involving being vegan at Easter. So I thought I'd make a post with all my little ideas and findings ready for the occasion. I'll discuss things such as Easter eggs, traditional nibbles and Sunday lunch (including the Aldi super 6 for Easter week!). 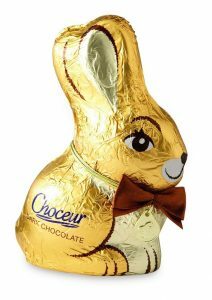 Aldi do a dark chocolate 'Lindt' style bunny - 79p (photo from The Hectic Vegan as Aldi do not sell things like this online!) Make sure you pick up the dark chocolate version as I think there is a non-vegan milk chocolate version too. Holland and Barrett also have Plamil mini egg halves - £3.25. These would be a good option to wrap in foil individually for a little egg hunt for children! There are many many more Easter eggs and treats than what I have listed above (check out the Vegan Womble Easter page for them all!) these are just the ones I have seen for lower than the cheapest Moo Free price I've seen. 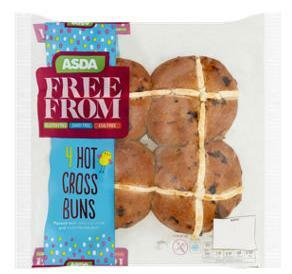 Asda have some Free From hot cross buns this year at 4 for £2 which are labelled vegan (nice and reassuring!) as well as being gluten free. 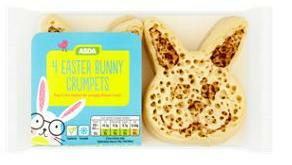 They also have some bunny shaped crumpets for £1. This is expensive for 4 crumpets, but depending on your plans this may be a nice little extra so I'm adding them in. 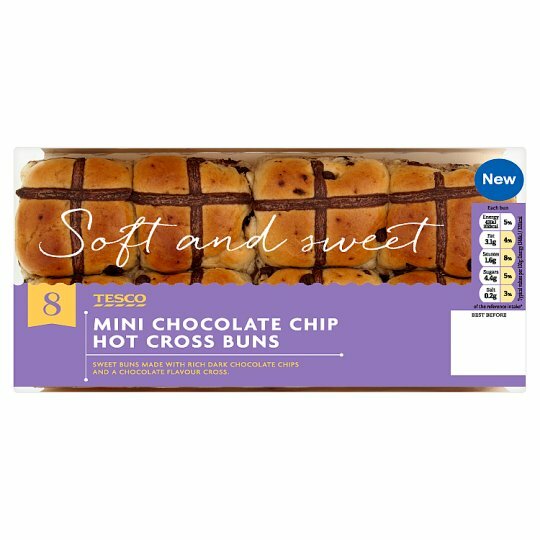 Tesco have some confirmed vegan mini choc chip hot cross buns for £1. You get 8 in a pack and I'd say 2 buns makes one smallish regular sized bun (but they're also a good size individually for children!) plus they're chocolate, so that's a win! Small notes: Last year M and S had some apple hot cross buns which were confirmed vegan. I haven't seen them yet this year but will keep a look out and update this post if I see them again! I think they were 2 packs of 4 for £2.50. 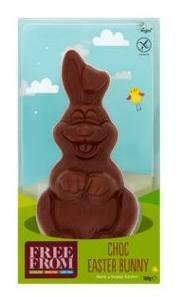 Co-op have ginger bread bunnies available, however I'm currently unsure of the price. There may be more hot cross buns available but I don't want to put any up which may risk having peel with shellac on. I will update this if any more are confirmed to be 100% vegan. Similarly to my Christmas post, I've worked out a delicious, reasonably priced roast idea for Easter. This is for a family of 4, but prices may vary (for the better hopefully!) as a lot of supermarkets have weekly veg offers, this is just a rough guide for ideas. A lot of this can all be roasted together whilst the rest can be steamed or boiled. Then just make up the bread sauce with some soya milk and cook the stuffing mix at the end (only takes around 10 mins usually). You can have a roast with 7 different items for £8.15 when adding up the expensive items. Not bad! Plus looking at it all I think it would go further than 4 people. Aldi have put a lot of useful roast veg in their super 6 offer from Wednesday 28th March. The following are all 19p each! If you're looking for any additional extras such as pies or roasts, don't forget to check your local Holland and Barrett for reduced items (I'm seeing a lot of Fry's new pies at the moment!) as a lot of these items can be frozen. Is there anything else you would like to see? If so, let me know!